Practicing gratitude not only makes you feel good, it physically CHANGES your brain! The first time someone mentioned that I practicing gratitude would make me feel better I rolled my eyes in disbelief. Really? Just thinking about something I’m grateful for will make me feel better? Even though I’m a Certified Hypnotherapist, I’m by nature skeptical. I don’t believe everything that comes down the pike. I knew that having more money and finding my soul mate would make me feel better – not something as silly as listing things I’m grateful for! Fast forward and years later I require every one of my clients to practice gratitude along with their AM/PM Tapping routine. Reading that practicing gratitude can physically change your brain was what turned me around. It was the proof I needed to show me that gratitude was worth practicing! “Something as simple as writing down three things you’re grateful for every day for 21 days in a row significantly increases your level of optimism, and it holds for the next six months. The research is amazing,” said Harvard researcher Shawn Anchor. A team of researchers out of Indiana University recruited 43 subjects suffering from anxiety or depression. Half of this group were assigned a simple gratitude exercise — writing letters of thanks to people in their lives — and three months later all 43 underwent brain scans. During the brain scans the subjects participated in a gratitude task in which they were told a benefactor had given them a sum of money and were asked whether they’d like to donate a portion of the funds to charity as an expression of their gratitude. Those who gave away money showed a particular pattern of activity in their brains. The participants who’d completed the gratitude task months earlier not only reported feeling more gratefulness two weeks after the task than members of the control group, but also, months later, showed more gratitude-related brain activity in the scanner. What this means is that practicing gratitude jump starts a healthy good-feeling new cycle in your brain. Counting your blessing now makes it easier to notice them later. So when things are tough, it’s easier to focus your energy on what is good and working in your life. And the more good you see in your life, the happier and more successful you’re going to be. When you go to bed tell yourself 5 things you are grateful for. You don’t have to write it down. Just think about it. Practice this for two weeks and let me know what a difference it makes in your life! 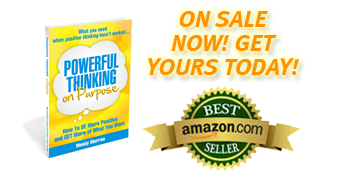 Learn step-by-step the proven tools Wendy's clients use to achieve personal and business success in her bestselling book, Powerful Thinking on Purpose. Available now in paperback or in Kindle Unlimited! It's been three years since our coaching sessions and I wanted to let you know that I use a lot of what you taught me to this day. I visualize often and listen to affirmations daily. Last year I exceeded my sales goals and I just started my Masters. Being an entrepreneur is the next goal. I've really done my best to build on what you taught me and it's served me well. 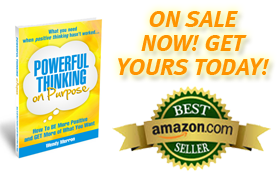 "I highly recommend reading Wendy's book "Powerful Thinking on Purpose". It is the perfect accompaniment for those providing healing practices as well as their clients to gain a fresh perspective in viewing life from a more positive, creative point of view. Great for those new to this work, as well as for those who just need a gentle reminder." Powerful Thinking on Purpose is unique and simple. After I finished the book I started using the techniques and I immediately noticed a drastic difference in how I feel. Powerful Thinking allows me to feel that what was once impossible is possible. In an effective and straightforward way, Wendy Merron shares simple steps that you can use immediately to take control of your thoughts and change your life. You may have read other books on "positive thinking" but in Powerful Thinking on Purpose you'll learn how to overcome worries and doubts and help your mind 100% “buy into” getting what you want. Read it today! With Wendy Merron's easy to follow blueprint, I was able to create positive thoughts right away and notice a great difference in my attitude and actions toward my goals. With these simple to learn suggestions, I also know I will reach them. Everyone who wants positive change in their life should read this book. © Copyright 2019 Powerful Thinking on Purpose · All Rights Reserved. Content and images may not be used without permission. · Website by The Webscaper.